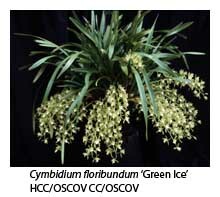 Although John Lindley first described the miniature species Cymbidium floribundum in 1833, Rolfe overlooked this when he used the name Cymbidium pumilum to describe the same species in 1907. Rolfe’s name was adopted by other authors and by those hybridisers who used the species to create a host of miniature-flowered cymbidium hybrids beginning in the 1960s and continuing to the present day. 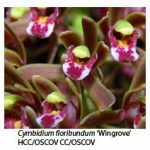 The International Orchid Register, maintained under the auspices of the Royal Horticultural Society, lists over 200 hybrids of Cymbidium pumilum registered between 1961 (perhaps a little earlier) and 2002. Eighty were made using C. pumilum as the pollen parent and 129 using C. pumilum as the pod parent. 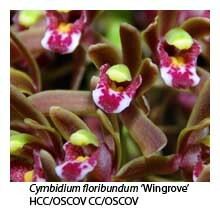 Among the earliest were Cymbidium Alice Williams (C. pumilum x C. Shina Black, 1961) and C. Dag (C. Esmerelda x C. pumilum, 1964). For much of this time, it was well known that C. pumilum was a synonym, and that the much earlier name C floribundum, should take precedence. 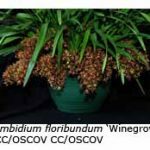 However, the Registrar continued to use the name C pumilum to register miniature cymbidium hybrids, no doubt because of the difficulty in changing the earlier written records. 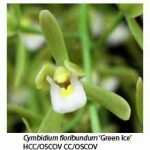 However, about five years ago the Registrar had a change of heart, and since then C. floribundum has appeared as a parent plant in the International Orchid Register. Cymbidium Butterfly Kisses (C. floribundum x C. Bold Move), registered in 2002, seems to have been the first. 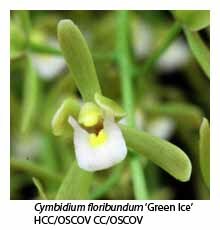 Currently (in 2007) 9 hybrids have been registered with C. floribundum as the pod parent, and 11 hybrids with C floribundum as the pollen parent. Curiously, the earlier hybrids are still recorded with C. pumilum as a parent, even though it would seem to be a simple computing exercise to make the change to C. floribundum (retrospective name changes have recently been made in the case of Cattleya Alliance hybrids). 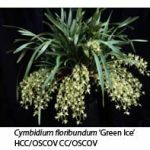 Cymbidium floribundum is native to China and Taiwan, where it usually grows at altitudes between 1500 m and 2800 m, often as a lithophyte. It is said to tolerate quite dry conditions, an observation which has prompted me to move my plant from the saucer in which its pot currently stands (since the introduction of water restrictions, many growers now stand their cymbidium pots in saucers of water). Its inflorescences usually carry 15-30 closely spaced flowers that measure 30-40 mm across. 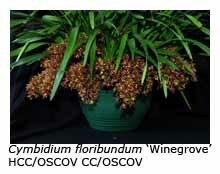 The petals and sepals are usually red-brown but there is a green album form (not a true alba) that is often used to create white, pastel and yellow miniature cymbidium hybrids. Julian Coker has told me that there is also a genuine alba form, a true albino that breeds consistently with that status. Most cultivars of Cymbidium Sarah Jean (registered as C pumilum x C. Sleeping Beauty in 1973) have white or pastel flowers because the album form of C. pumilum was used as the pod parent and the albino white C. Sleeping Beauty ‘Sarah Jean’ as the pollen parent. However, some of you may grow Cymbidium Sarah Jean ‘Helen’, which has striking red flowers. This was one of the seedlings resulting from a Sarah Jean re-make by Julian and Frances Coker, using the more common coloured form of C. pumilum as pod parent and C. Sleeping Beauty ‘Golden Queen’ as the pollen parent.